The proportion of consumers in Vietnam who put their spare cash into savings is the highest globally (76 per cent), followed in Southeast Asia by Indonesia (70 per cent), the Philippines (65 per cent), Malaysia and Singapore (63 per cent) and Thailand (62 per cent), according to a Nielsen report on the Consumer Confidence Index released on August 3. Like Vietnamese, other Southeast Asian consumers continue to be among the world’s most avid savers, with more than two in three (68 per cent) putting their spare cash into savings. Consumers in Vietnam are also eager to spend on big ticket items, the report noted. “After covering essential living expenses, around two in five Vietnamese consumers are willing to spend on big ticket items such as vacations (41 per cent, with a 5 per cent increase versus last quarter), new clothes (38 per cent) and out of home entertainment (37 per cent),” Nielsen wrote. “Vietnamese consumers are known for prioritizing saving over spending and it is this mentality that influences their careful spending patterns, especially for basic commodities,” Ms. Nguyen Huong Quynh, Managing Director of Nielsen Vietnam, said. 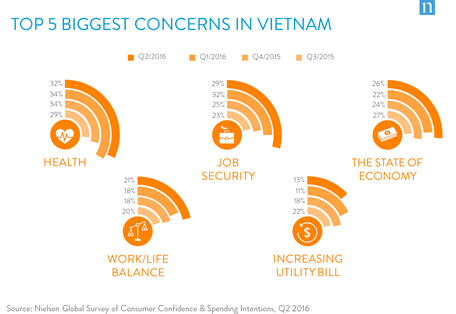 In the second quarter of this year, despite falling slightly, consumer confidence in Vietnam remains at a high level, with an index score of 107 (down 2 percentage points compared to the previous quarter), keeping Vietnam as the 7th most-optimistic country globally, the report added. “During the time of the Internet of Things, market sentiment immediately and clearly reflects the Good, the Bad and the Neutral,” Ms. Quynh said. “Vietnamese consumers pay close attention to what is happening, are easily influenced by word of mouth and social media, etc., and quickly take action.” That requires even faster action from manufacturers and retailers to foresee and address their concerns in consumption decisions, she explained. Vietnamese continue to be optimistic about the local economy compared to other countries, reflecting its rising affluence, the continued growth of the middle class, and a stable economic outlook, she went on. Health remains a key concern, with nearly one-third of consumers (32 per cent) citing health as their biggest and second biggest concern over the next six months. Job security and economic uncertainty remain the second and third biggest concerns (29 per cent and 26 per cent, respectively). In the first seven months the consumer price index (CPI) in Vietnam increased 1.82 per cent year-on-year, according to the General Statistics Office (GSO). In July it increased 0.13 per cent compared to June and 2.39 per cent year-on-year. Eight of the eleven categories in the CPI basket of goods rose in price during the month. The highest increase was in transport, up 1.19 per cent compared to June, primarily due to higher petrol prices. While petrol prices were cut on June 20 and July 5 they did not offset the increase on April 6.